Need glasses? No, they're for real! If you're like us and can appreciate things like backwards messages on albums, then this crazy, upside-down guitar is right up your alley. Gibson's original Flying V was always for the left-of-center kind of player. And now, for the truly daring guitarist, comes the return of the limited edition Gibson Reverse Flying V, a radical approach to an already radical instrument. 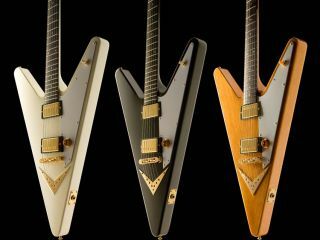 Gibson's original run blew out of stores as if the guitars had wings, and this small number -- they're only making 300 of these babies -- is bound to do the same, making them instant collectors' items. Each instrument features a solid mahogany, V-shaped body, four-ply pickguard, Kluson-style green key tuners, and retro-style V-shaped gold tailpiece. The neck sports the traditional Flying V profile, a hybrid between the classic Fifties rounded contour and the popular Sixties slim-taper. The ebony fingerboard and gold-plated truss rod cover round out this testament to Gibson's bold and pioneering design tradition. With a pair of '57 Classic humbuckers, for legendary vintage Gibson tone, the limited edition Reverse Flying V is available in Classic White, Ebony, and Natural. Remember, there's only 300 of them, so if you don't act now, you're just going to have to stay rightside-up like everybody else. List price is $3, 448.00 U.S.